Between belief and disbelief, certainty and uncertainty, trust and distrust lies doubt. Doubt can be deliberate questioning or a state of indecision, resulting in a reassessment of what reality means or a paralyzing suspension between contradictory propositions. An uncomfortable condition, as Voltaire observed, but preferable to certainty, which is inherently absurd. Or some surprising gap stretching intellect and emotion, resulting in delight. Join us in this intriguing gray area as we prepare our Winter 2013 Doubt issue. If there’s such a thing as a God gene, as Dean Hamer has hypothesized, I must at the very least be a carrier. My father, Viktors Jurģis, once pursued a theology degree at the University of Latvia and a cousin, The Very Reverend Juris Jurģis, managed to catch one at the University of Oxford. But there’s many a slip ‘twixt the genotype and the phenotype, so at an early age I became a confirmed skeptic. Still, I was attracted to writers who were able to pull back a bit from the constant navel gazing that seems to be an occupational hazard to consider more cosmic questions. Even as a teen, my favorite poet was TS Eliot, whose “The Waste Land” and other works not only defined nihilism for his and subsequent generations but also formed the basis for his becoming a staunch Anglo-Catholic. And as an adult, I’ve frequently found myself wondering why–particularly in the United States, which stands alone among developed nations in its emphasis on religion–literature is so secular. So, I asked Avraham Azrieli, a local novelist interested in such matters, to briefly share his thoughts on the subject. I don’t see how a novelist can write truthfully about people while avoiding their religion. For that matter, I don’t see how a writer of nonfiction can credibly author a book about history, politics, crime or psychology while skipping over the dominant role religions play in human life and death. Most curiously, though, is the difficult choice facing the storyteller: is religion a protagonist or an antagonist? In my novel The Jerusalem Assassin, the leader of an ultra-Orthodox Jewish sect, Rabbi Gerster, must prepare his heir Benjamin to take over the leadership. “It’s my respect, not timidity,” Benjamin said. They reached the entrance to the apartment building where Benjamin lived. He leaned against the stone wall, as if feeling weak. “Absolute truth is in the eye of the beholder,” Rabbi Gerster said. As a novelist, my biggest challenge is to be true to the way each character would behave considering his or her background, personality and complex identity. Only then does the story become believable to the readers. And primary among those traits is how a character practices his or her faith–is it a tool, a shield or an inspiration? The test is whether a person remembers that faith by its very essence is the belief in something that cannot be proven. One can only speculate whether human conflict throughout history would have been less hostile if those who carried the torch of their religion remembered that each faith could not be an absolute truth, not only because faiths contradict each other with equal validity and inability to prove one truer than the other but also because, in the absence of doubt, faith is nothing but an uninspiring alternative reality. Reflecting on what Azrieli says, I recall that in college my father not only professed the Lutheran faith but also hung out with Old Testament types such as his rabbi pal, who helped him learn to read that part of the Bible in the original Hebrew. That rabbi likely resembled Azrieli’s fictional rabbi, with whom my father would have enjoyed matching wits. In his latter years, my father was limited in his choice of sparring partners. Much to my mother’s dismay, he was known to invite the Seventh-Day Adventists and other proselytizers who knocked on his door inside for further discussion. “What would you do,” he would ask, “if you saw that all the medical books in your doctor’s office were written in the Nineteenth Century?” “I’d definitely get myself a new doctor,” they would say. “Then, would you not at least consider getting a second opinion knowing that the only book that your minister relies upon, which I assume is the King James Bible, was translated in the Seventeenth Century from a First Century work? 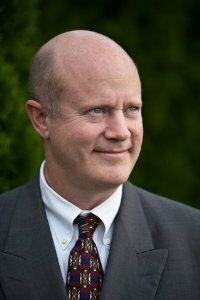 Avraham Azrieli is an attorney and author living in Columbia, Maryland. He published two nonfiction books, Your Lawyer on a Short Leash: A Survivor’s Guide to Dealing with Lawyers and One Step Ahead: A Mother of Seven Escaping Hitler’s Claws, before turning to fiction. His novels include The Masada Complex, The Jerusalem Inception, Christmas for Joshua, The Jerusalem Assassin and The Mormon Candidate. 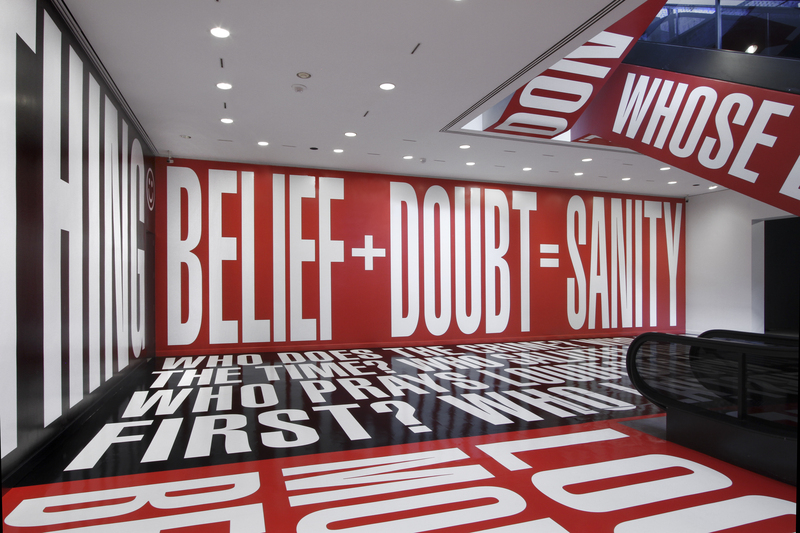 For more from this series, see Dylan Bargteil’s “Delving into Doubt: Worship No Idols.” For more about the exhibit in the image above, see “The Unsettling, Text-Driven World of Barbara Kruger’s ‘Belief+Doubt'” in The Atlantic. This entry was posted in Essay and tagged Blogs, Books, Craft, Doubt, Essays, Fiction, Literary Journals, Literature, Religion, Writing. Bookmark the permalink. Thanks, Clarinda. I’ve always thought it foolhardy to separate belief systems from their cultural context. This is a terrific piece. I have been thinking about the Constitution in similar terms lately, as it faces similar problems in interpretation extending to issues of gun rights, freedom of speech, and even the tax code according to some. While we fortunately have a much broader, more contemporary, legal canon to rely on in particular cases, the Constitution remains a document of incontrovertible authority. At least to a skeptic like myself, it seems silly to invoke the Constitution in such a way when it is so old, and has only been modified 17 times in over 200 years. Moreover, amendments almost never in a way that is clearly contradictory to a pre-existing portion of the document, making them more addendums than amendments. I feel that fervor and faith in the Constitution runs deeper in this country than with the Bible.